We are manufacturers & suppliers of hospital waste collection bag made from prime grade or 100% virgin & recyclable material. - LDPE and HDPE material. - Available in various sizes, thickness and colors. - Printing can be done in flexo graphic. 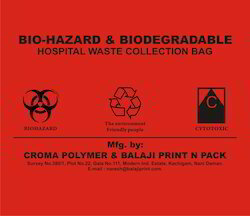 Bio Medical Wastes Bags Are Available In All Colours.materials Are As Per Gpcb Nomes.